From intimate barbecues in back gardens to prestigious parties for hundreds of guests, Simon will entertain and amuse your friends and family at all kinds of events, in all kinds of venues. 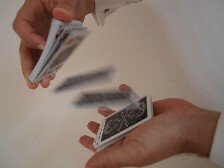 His sensational sleight of hand and mystifying mindreading feats will conjure up atmosphere, delight and astonish your guests, and help to ensure that your event is a great success! 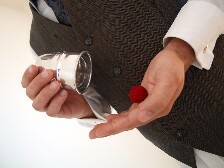 Get in touch with Simon to find out how his magic could enhance your next party. "Simon graciously accepted my offer to perform at my husband's surprise 40th birthday party. We had an eclectic group of people from all parts of our lives, and all parts of the world. Our group ranged from 3 years old to 65 years old and Simon did a fantastic job of entertaining us all. His presence was not at all intrusive and it felt very natural to have him at our home. 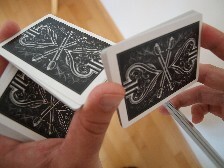 His range of magic talent is amazing and I especially enjoyed the card tricks. I hope to have another reason to hire him again in the near future." "Simon is an AMAZING magician and mentalist. He never ceases to captivate me, and leave me wondering: 'how did he do that?' Simon performed at my 30th birthday party, keeping guests entertained and leaving us all deep in thought and wanting more."